If you use SugarCRM, you probably know how important it is to always keep Lead status updated. Failing to do this may lead to the situation when you forget to process Lead timely. In this video we share an example of implementing simple logic for Leads in Sugar, using Logic Builder. 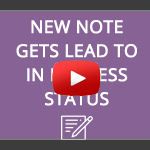 You’ll see how a Lead automatically gets In Process status, once a new Note is added to Lead. Quite useful SugarCRM customization, isn’t it?